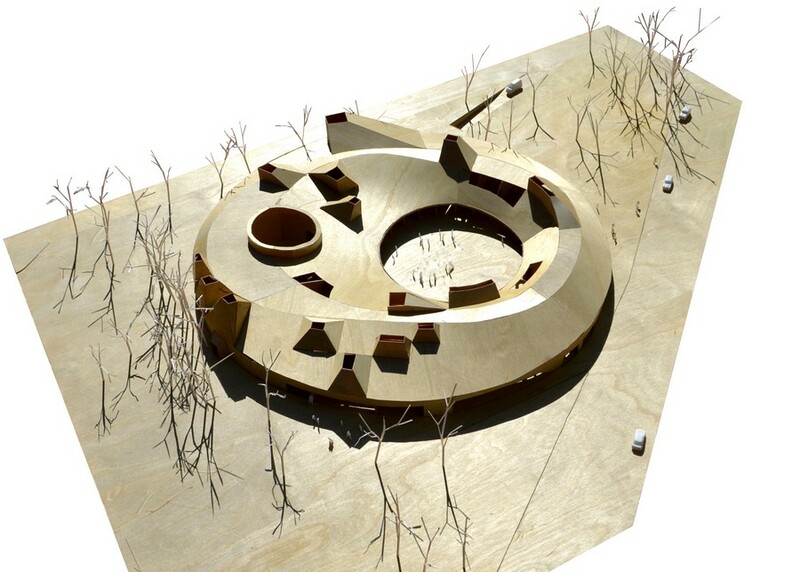 Sports Facility – Architecture Development in Hungary – design by NAPUR Architect Ltd. The restoration and modernization of Hungarian swimming pools, including The Duna Arena, as well as expanding the existing pool facilities is a long-standing demand of athletes and the part of the general public devoted to swimming. Due to economic and reasonable considerations, the investments took place simultaneously with the developments tied to the 2017 FINA world championship in Budapest. The Hungarian capital city of Budapest originally won the right to host the 2021 FINA World Aquatics Championships in 2013, yet the previously designated site of the world championship, Guadalajara, Mexico unexpectedly withdrew from hosting the event in March 2015. At the time, Budapest and the Hungarian government accepted the undertaking of hosting the event four years earlier, in 2017. Therefore, whilst previous bidders had six to eight year for the preparations, Hungary had a total of two years to prepare for the world championship, construct the arena for the competitions and complete the related investments. 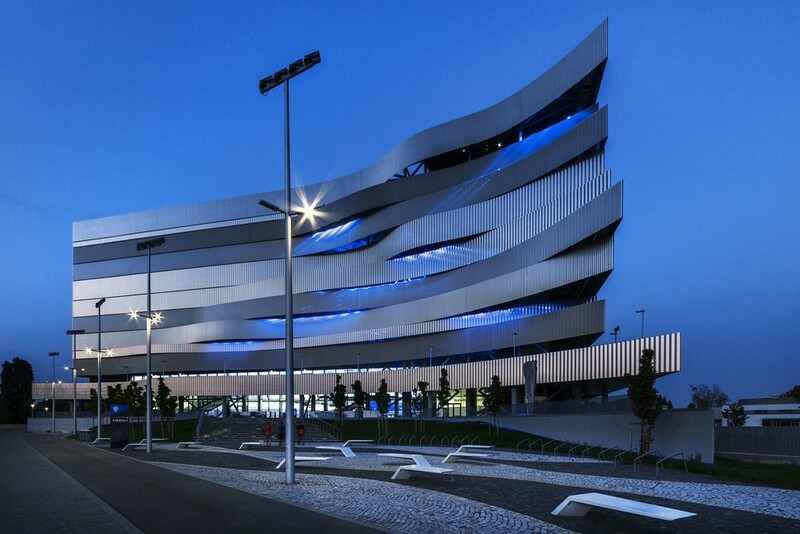 The Duna Arena served as the central building of the FINA world championships events taking place in Budapest. The building is located close to the northern gateway of Budapest, on the banks of the Danube, easily accessed by bus, tram and the nearby metro line, as well as by boat, bicycles and on foot from the Margaret Island and the city centre. The facility currently adheres to the latest FINA and IOC professional sporting demands. Apart from professional competitive sports, it also caters to the urban general public, from children to the elderly. “We didn’t build the Duna Arena for the world championship, it would have been out of the question to carry out such a huge investment purely for the sake of a world competition. 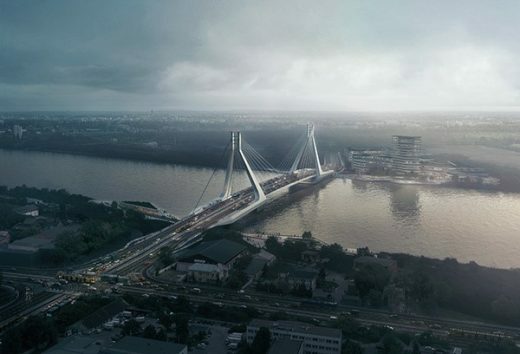 We built it because it offers long-term benefits for the citizens of Budapest, including the residents of Angyalföld and Újpest,” said Secretary of State for Development of Budapest and Government Commissioner of International Sport Events, Balázs Fürjes. 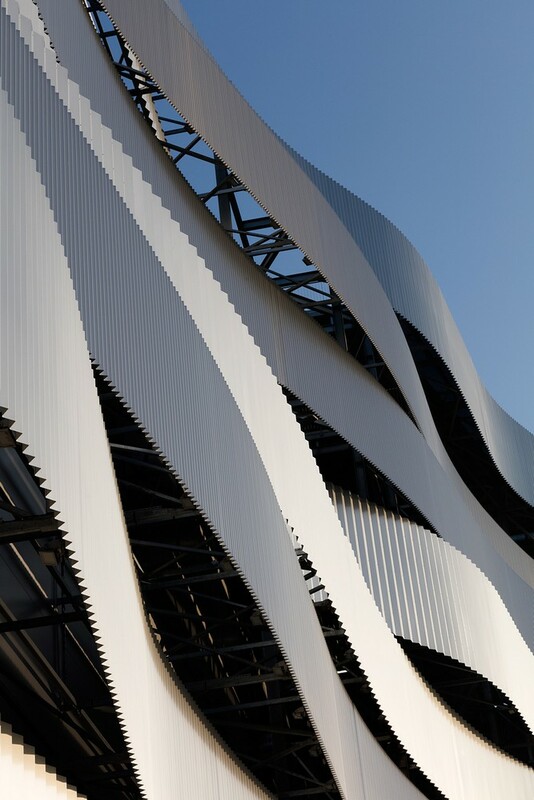 As the arena must serve two – competition and normal – functions, the most important factor in the planning of the building was to lay down spatial foundations which could cope with the changes, said architect and creator of the Arena, Marcel Ferencz. We opted for a nine-partite spatial arrangement previously used by ancient cultures. The headroom of the main hall can accommodate up to ten additional rows of spectators, thus we planned with a significant reserve which impacted the scale of the structure. The bracketed nature of the facade serves as a link and connection between the main and ancillary masses of varying heights, whilst the major support structure remained part of the composition while retaining its functional logic. The four structural supports orient the building’s partitioned traffic systems and serve as a link between the various functions. We resolved the inevitable issue of density arising from its functions with the transparency of surfaces in the spectator zones. Upon entrance, the operation of the building becomes immediately transparent, providing views on both sides of the building as mass and transparency accommodate one another. The three-level, 25,000 sqm competition hall features a 10-lane, 50 meter competition pool with a depth of 3 meters, along with a 5 meter deep, 21×25 meter pool and diving tower as well as a 6000-capacity spectator stand, symmetrically positioned along the length of the hall. The main building’s warm-up hall features a 10-lane, 2.2 meter deep and 50 meter long warm-up pool (on a half-pool sized area with an adjustable bottom), a 1 meter deep, 8×12.5 meter children’s pool and a jacuzzi that can accommodate up to 25 people. 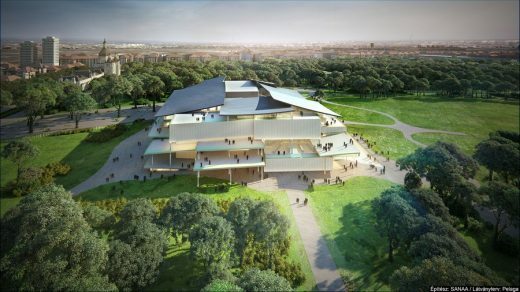 The main building also houses stores, a sports museum, fitness centre, professional gyms, buffets, a VIP viewing area, conference and events hall, media studios, offices and meeting rooms as well as auxiliary premises (maintenance and operational rooms, sanitary units, changing rooms, medical and security rooms). Temporary structures (across 3 levels with a floor space of 25,000 sqm) were erected for the duration of the world championship, connected to the long sides of the building. 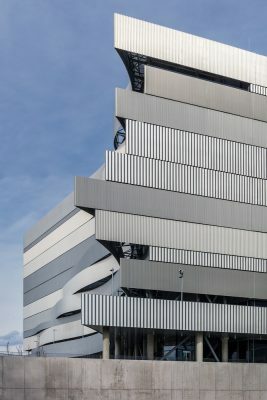 This temporary building housed social and catering points for guests, as well as FINA media, sporting technology and event-hosting operational rooms. The temporary spectator stands had a capacity for an additional 9000 viewers. Therefore, the full, expanded floor space of the building amounted to 50,000 sqm with a capacity for 15,000 people. “For the duration of the world championship, the Duna Arena was built with a temporary spectator stand for 15 thousand people, which was not necessary for its everyday operation. Therefore, we dismantled the stands and its structure will be used to a build a parking garage in the future and for the construction and roof insulation of halls. 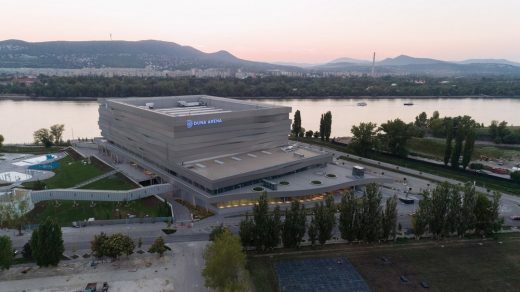 The dismantling was completed and the Duna Arena opened its doors to the general public in July 2018 as a facility catering to the swimming instruction of young school-age and kindergarten students, as well as serving as a training base for the Hungarian junior and adult competitive sport,” added Balázs Fürjes in relation to the refurbishment of the Duna Arena. Apart from the FINA world championships, the Duna Arena has hosted countless grand-scale sporting events since its opening, including the water polo LEN Champions League Final in 2017, followed by the “Final Eight” Super Finals of the FINA Men’s Water Polo World League a year later. The site also hosted the World Junior Artistic Swimming Championships in July 2018 and the FINA Short Course Swimming World Cup in October 2018. 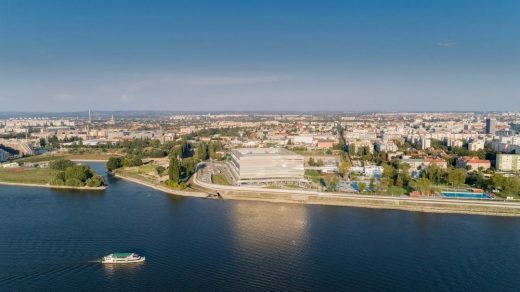 In 2019 will see the Duna Arena hosting the FINA Women’s Super Final, the Super Final of the FINA Artistic Swimming World Series, the FINA World Junior Swimming Championships and one of the venues of the FINA Swimming World Cup (25m). 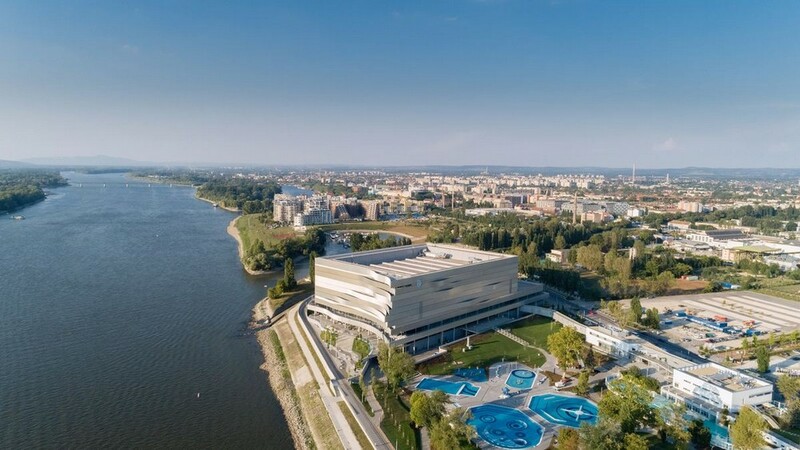 In January 2020 the Duna Arena hosts the European Water Polo Championships and the European Aquatics Championships in May. Budapest will also host the FINA World Swimming Championships (25 m) in 2024, which means that the Duna Arena will host the top swimmers of the world for a second time over seven years. 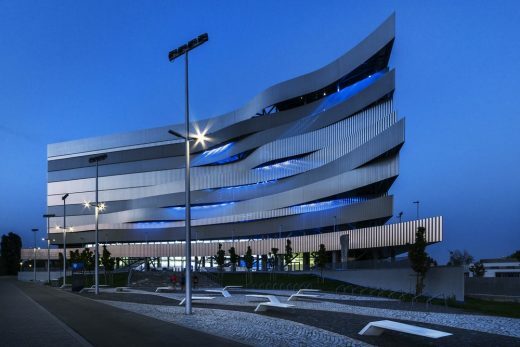 The exceptional multi-functional nature of the Duna Arena is well-illustrated by the fact that it hosted the European Swimming League (LEN) congress in July 2018, followed by the Youth World Boxing Championships in August. 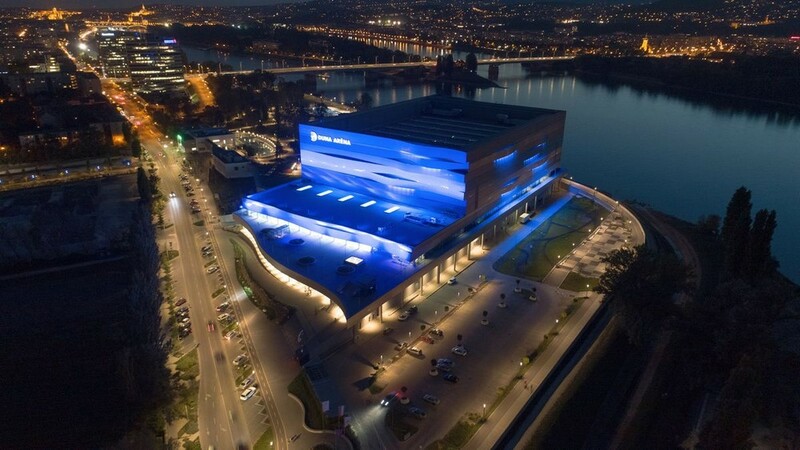 The Duna Arena features technology that makes it possible to cover all three pools within a period of 24 hours. 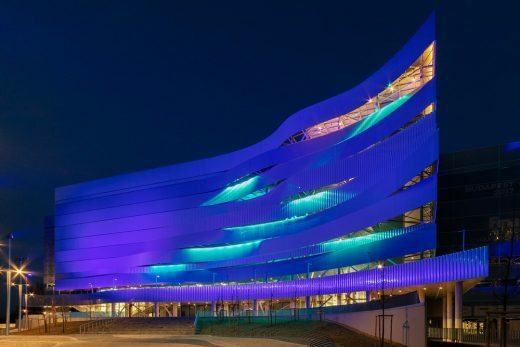 Therefore, apart from the aquatic sports, the building can also host grand-scale land sport events or even concerts and exhibitions in the future. The central building is 44 meters high. The 3,000 ton steel roof structure resting on four 10×10 meter reinforced concrete pillars has a span of 90×120 meters. The headroom of the central hall is 30-38 meters. 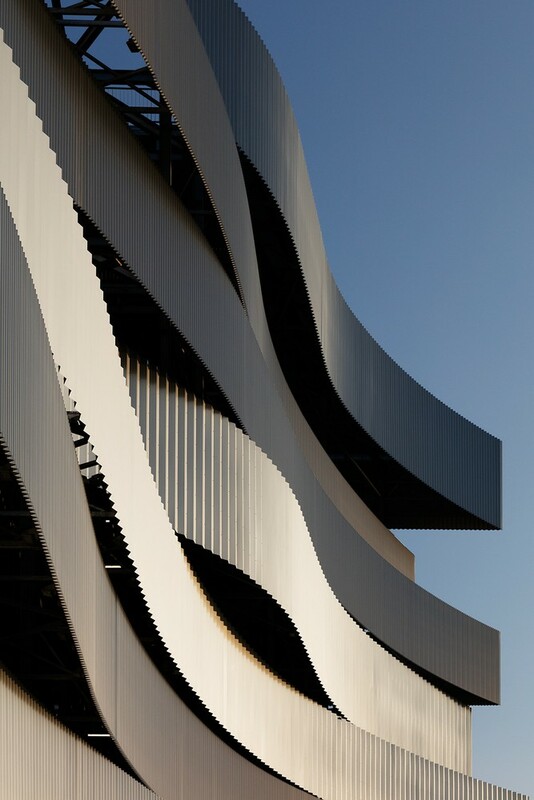 The building features a double-layered facade. 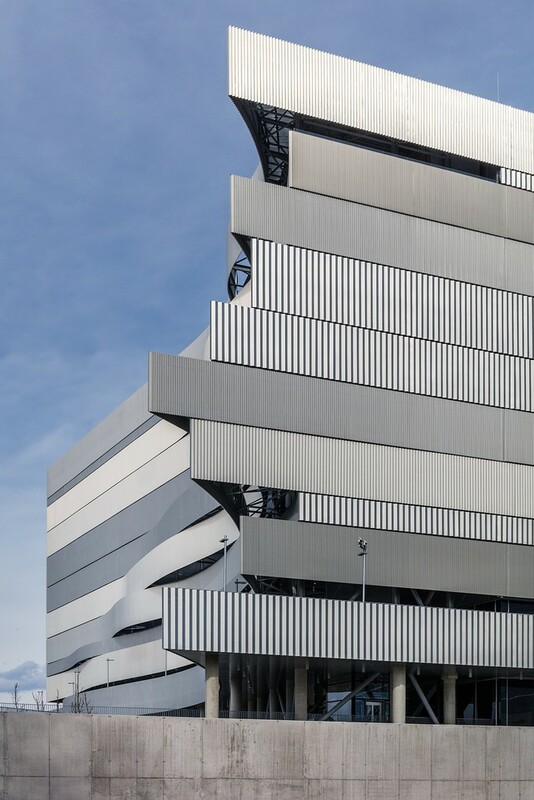 The primary thermal layer is a sandwich panel, while the secondary decorative layer consists of profiled plain lacquered aluminum sheets in a bracketed arrangement. 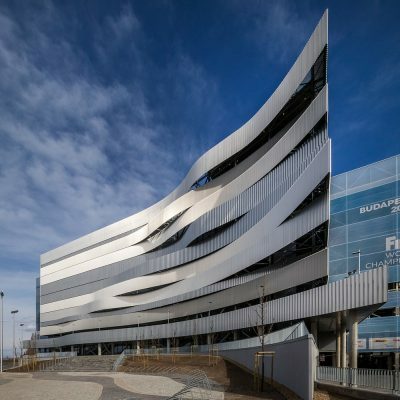 The ground floor of the three-level structure features the service areas and separated entrance points for VIP, media, water works, operational, security and electric premises. 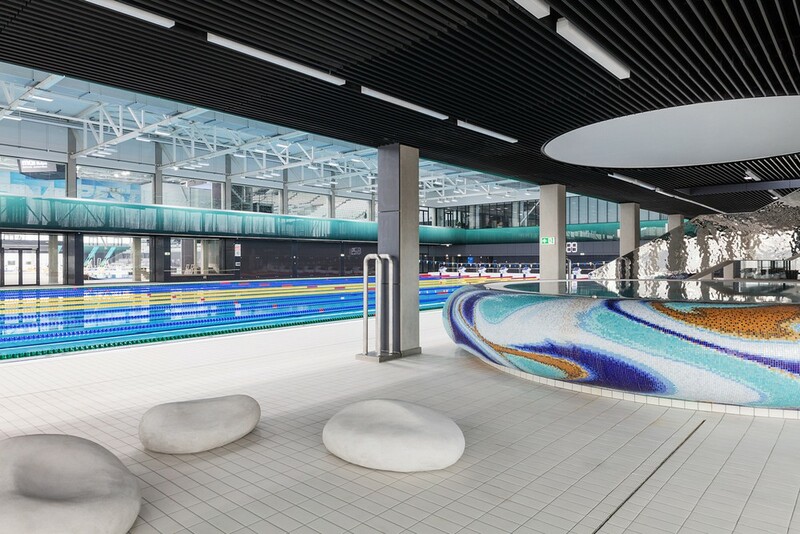 The first floor consists of the aquatics athlete spaces, whilst the second floor houses spectator spaces, corridors and service spaces. This level also features a 6,000 sqm general audience encircling terrace, which provides separated entrance opportunities. In its normal, everyday capacity, the encircling space is commonly utilized as a sundeck accompanying the pools. The western side features a panoramic terrace at 38 and 44 meters of height, equipped with an accessibility elevator, offering views of the popular peak of the Visegrád Mountains, Dobogókő, all the way to the Hungarian Parliament Building. 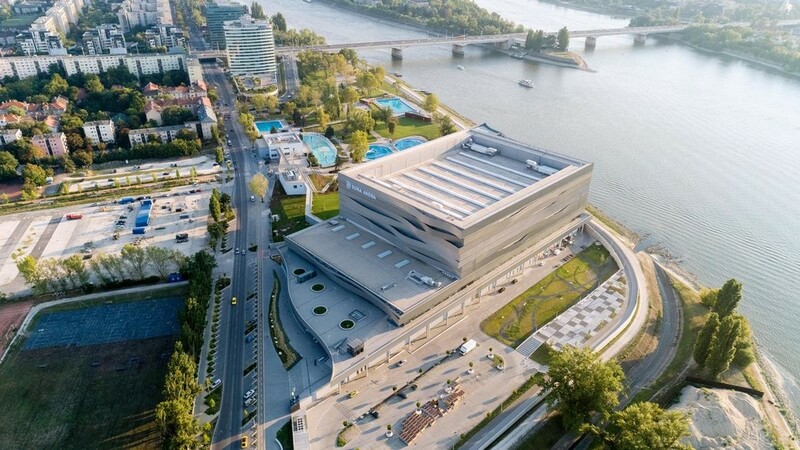 The wave-like facade of the building is indicative of the direct ties between the “aquatic” nature of water and the Danube River. 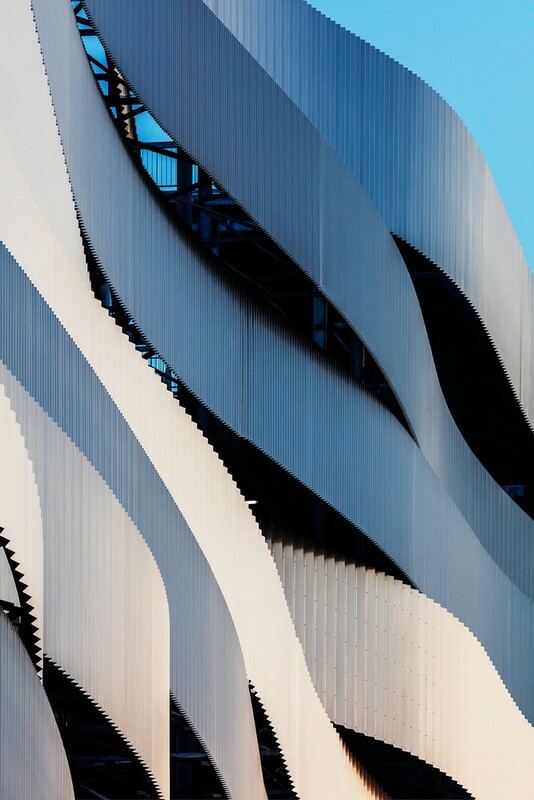 Due to the alternated sheet profiling of the facade, the building mirrors its surroundings in a continuously changing manner in the various times of the day. In the evening, the decorative lighting spilling through the gaps of the waves brings the Duna Arena to life on the banks of the river. “We preferred creating a natural, instead of an urban structure on the banks of the Danube that is capable of reacting to the river’s various moods. In sunlight, it’s shiny and cheerful, while functioning as a sanctuary in gloomy, foggy weather. Therefore, the reflective surface that mirrors and establishes a discourse with its surroundings fits into the surface of the Danube with its raw, silent surfaces,” said Marcel Ferencz about the design of the facade. 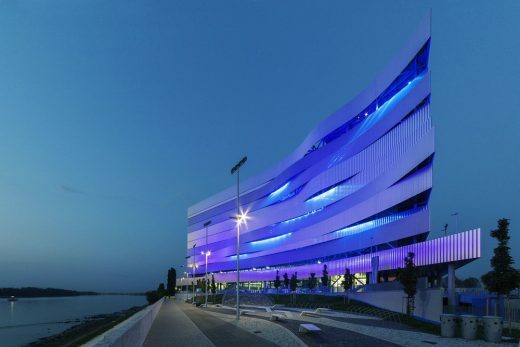 The building features brackets of dense and glass surfaces, providing views of the Danube even for those passing along Népfürdő utca in front of the arena. In February 2017, after thoroughly inspecting the Arena – and surveying its safety and sports technology innovations – the hosts of the Tokyo Olympics of 2020 noted that they consider the Duna Arena to be a model for the swimming pool to be built for the Olympic Games. 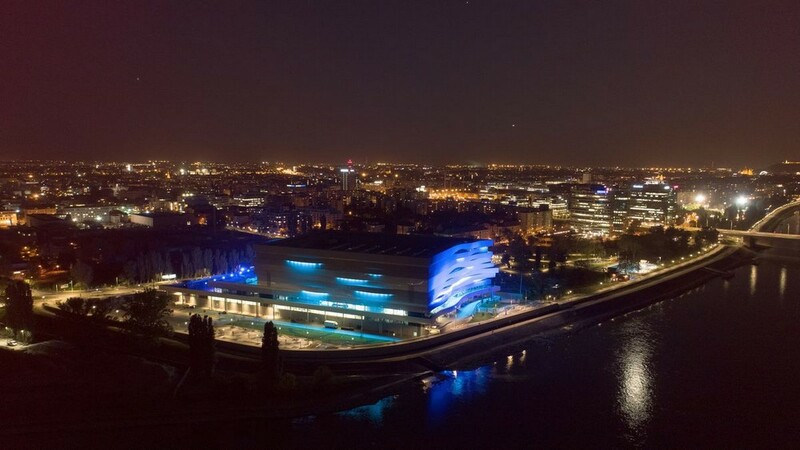 The building received similar recognitions in January 2018 from the Organising Committee of the Paris 2024 Olympic Games, who evaluated the detailed planning and implementation methods and claimed the Duna Arena to currently be the best competition pool of the world, serving as a model for the Olympic pool to be built in Paris. General Designer: Tecton Architect and Consulting Ltd. Structural Designer: EXON 2000 Ltd.